Research focus: Smallscale turbulent mixing, its interaction with larger-scale flows including internal waves, direct observations at sea, models and theories of turbulent mixing generated by mean shear and internal waves, parameterization of turbulent mixing in numerical models. Hartmut Peters joined ESR in 2008 after time on the faculties at the University of Miami and the State University of New York at Stony Brook. He is a seagoing physical oceanographer interested in smallscale, vertical turbulent mixing in oceanic and coastal waters. 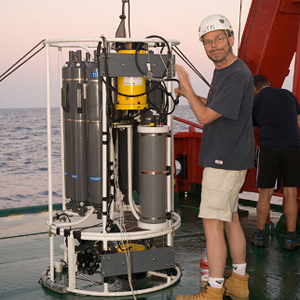 He learned how to make turbulence measurements at sea as a postdoc with Mike Gregg at the University of Washington. Hartmut Peters’ main focus is on the interaction between smallscale turbulence on the one side and larger-scale motions on the other side: mesoscale and largescale currents and – especially – internal waves. He has a long-term interest in how to parameterize turbulent mixing in numerical ocean and coastal circulation models. In collaboration with Helmut Baumert (IAMARIS, Hamburg, Germany), he is currently developing a theory / model of a unified treatment of mixing generated by waves and mean shear. The topic of vertical mixing may sound exotic, but is important in a practical, every day sense. Hartmut Peters was recently involved in a NOAA/NSF-sponsored project aimed at improving the performance of operational climate models used in climate forecasting. One of the problems of these models is gravity currents, fast-flowing heavy waters formed in cold or dry ocean basins such as the Nordic Seas, Antarctica and the Mediterranean. The gravity currents transport water down into the deep ocean as part of the vertical overturning circulation of the oceans. This overturning circulation is a crucial part of the earth’s climate system. Vertical mixing crucially affects the dynamics and properties of gravity currents. B.S. (Vordiplom) (1971) University of Kiel, Germany (Oceanography). M.S. (Diplom) (1974) University of Kiel, Germany (Oceanography). Ph.D. (Dr.rer.nat.) (1981) University of Kiel, Germany (Oceanography). In accordance with fair use rules, most papers can be made available by the author as pdf files. Send a request by e-mail to hpeters (at) esr.org – even for ancient papers. Nash, J. D., H. Peters, S. M. Kelly, J. L. Pelegrí, M. Emelianov, and M. Gasser (2012), Turbulence and high-frequency variability in a deep gravity current outflow, Geophys. Res. Lett., 39, L18611, doi:10.1029/2012GL052899.